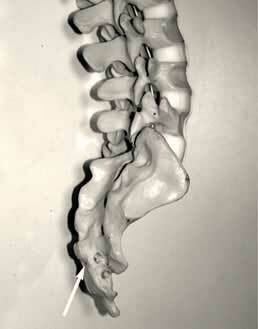 This photo demonstrates the angle that the needle is inserted into the sacral hiatus. This is the bony opening seen from the side, directly in front of the tip of the arrow. When undergoing this procedure, you will be lying on your stomach and your specialist will insert the needle quite close to, or into, the buttock skin fold, depending on your anatomy. A caudal/sacral block is performed for pain that is caused by inflammation and irritation in the spinal canal. The aim of the procedure is to reduce the inflammation inside the spinal canal. This will then bring about partial or complete (but usually temporary) relief of the pain, spasm and referred pain that this inflammation around the nerves can cause. The reason why your specialist performs this procedure and not a more invasive procedure, is because he or she is trying to be as conservative as possible in treating your symptoms. When undergoing this procedure, you will be lying on your stomach on bolsters or pillows. Your specialist will use an X-ray machine to guide the needle that is used to do the procedure with. The needle is placed directly into the sacral hiatus – this is at the bottom end of the spine – and a mixture of steroids and local anaesthetic is injected into the sacral hiatus (also called caudal hiatus). This procedure is performed with local anaesthetic and sometimes with sedation. This procedure can also be performed on an out-patient basis under CT guidance by a radiologist. You may sometimes have a bit of discomfort directly after the procedure, but this will clear up very soon. You will be allowed to move around freely following your procedure. This procedure is usually performed as a day procedure. Routinely you will receive a date for your follow-up appointment with your specialist. This may vary from anything between two and six weeks, but you will be seen earlier if there are any complications. It is important to realise that you will have to protect your back for the rest of your life and apply good back habits (see the section Caring for your Spine). This procedure is part of conservative management, bear in mind that it may fail and further treatment including surgery may be required.